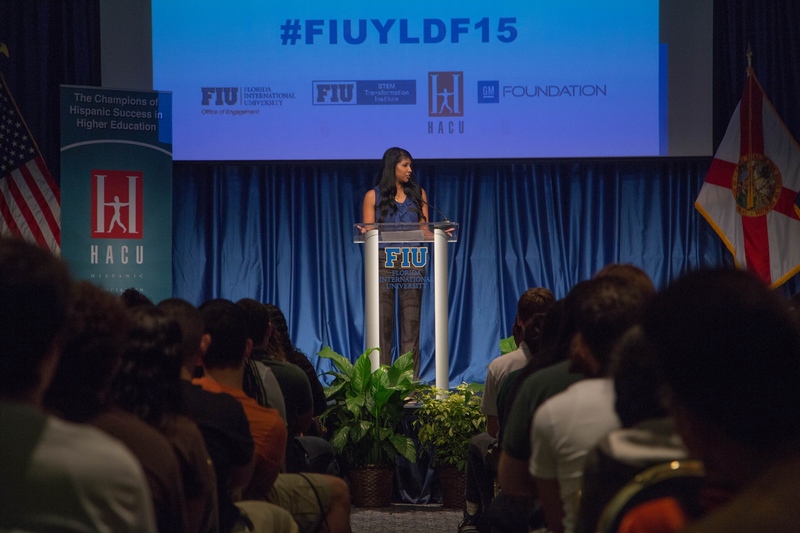 FIUteach Associate Director Vishodana Thamotharan addresses students at the HACU 2015 Youth Leadership Development Forum. The annual HACU leadership event allows high school students considering careers in science, technology, engineering and math (STEM) to experience STEM through hands-on activities. 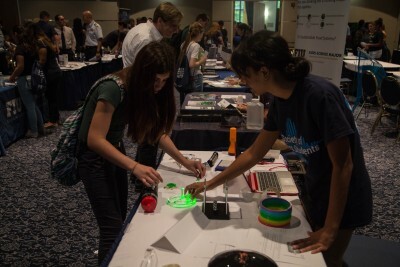 At FIU, undergraduate STEM students facilitated group breakouts and served as guides on tours to active learning classrooms, the Stocker AstroScience Center, the Mastery Math Lab, PG6 Tech Station and several of FIU’s state-of-the-art research labs. In addition, the students had the opportunity to visit the STEM Resource Fair where FIU student clubs and various university programs showcased STEM-related exhibits, including the Aerospace Engineering Club, Astronomy Club, Biology Honors Society, FIUteach, Panther Robotics and the Society of Physics Students. “I was inspired by how FIU Faculty, staff and students mobilized to provide high school students with experiences that highlighted the diversity of the STEM fields,” said Vishodana Thamotharan, associate director of FIUteach – a program created to produce high-quality STEM teachers. Hosted in part by FIU’s STEM Transformation Institute, the Youth Forum – held last weekend in Miami Beach, Fla – preceded HACU’s 29th Annual Conference on Hispanic higher education. Dedicated to education initiatives within the STEM fields, the FIU STEM Transformation Institute utilizes existing and develops new evidence-based educational methods. The institute was recently included in the White House’s catalog of Bright Spots in Hispanic Education in part for helping to improve attitudes towards science, largely through a shift from lecture-style classes to active learning, where students engage in science activities. “Seeing the engagement of the students, teachers and FIU students underscores our impact on the South Florida community and inspires us to be the instructional enablers of future STEM innovators,” said Laird Kramer, founding director of FIU’s STEM Transformation Institute. For photos of the event including the STEM resource fair, click here. I’m currently in high school and am looking into learning more about my chosen field of architectural engineering. I would to attend your seminars, job fairs, internship, etc. Please add me to your mailing list.